Evora Bathroom Vanity Unit & Basin Set- Only £169.99! Full unit set featuring vanity unit, unit top and basin as one complete package, in a range of sizes and colours. In stock now for just £169.99 including VAT! Hurry while stocks last! The Evora Bathroom Vanity Unit & Sink features a stylish, contemporary design and comes complete with a polymarble basin. Available in a choice of two sizes, in either a stylish Gloss White or a timeless and classic Light Walnut, this high quality bathroom furniture unit is an ideal addition for any home. This vanity unit is perfect for the modern home and boasts a modern, cubic look with crisp, clean lines. It is equally at home within a cloakroom, an ensuite or part of a larger bathroom suite. Quality throughout, at a superb price. This is high quality bathroom furniture which is crafted from the finest materials. It comes as standard with soft closing hinges. The basin comes with 1 tap hole and without an overflow making it ideal for use with an unslotted waste. Whilst the picture shows the tap on the right hand side, simply turn the basin around if you want it on the left hand side. It is fantastic value and excellent quality. A luxury Poly Marble is one of this item's selling points - a composite mixture of polyurethane resins, marble dust and has a gel coat finish. Some manufacturers use a lower percentage of marble dust but that is not the case with these basins. Our Poly marble is a heavy, rigid and solid product that has been used in the manufacture of bathroom products for over 30 years. The percentage of basins, particularly in vanities, that are now polymarble is increasing all the time. This is because the material is strong, durable, easier to mould into sharp, smooth angles and lines and does not pit during manufacture, leaving you with a super smooth, easy to clean surface. VIP Bathrooms are one of only a very few companies to offer the elegant and timeless Light Walnut finish option, as well as the stylish and highly popular Gloss White. 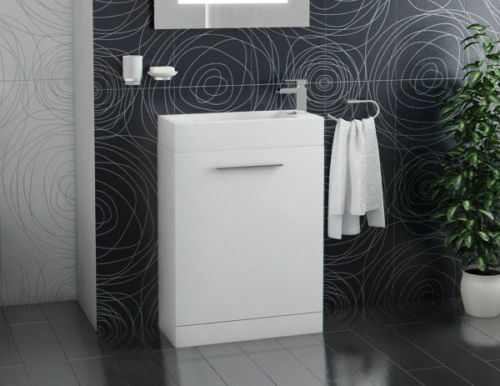 This excellent vanity unit is also available ina variety of sizes, allowing you further customisation and flexibility in tailoring this unit to your bathroom. The Evora bathroom furniture range offers unbeatable variety. Create your ideal bathroom setting with the VIP Bathrooms selection of furniture. Gone are the days when the bathroom was just a functional room. Today's modern bathroom is a place where you can unwind and relax, with a range of stylish yet practical bathroom furniture options that will make a bathroom you'll be proud to call your own. These eye-catching bathroom furniture sets feature a choice of matching furniture cabinets, basin stands and wall units, available in various colours and styles. Combining modern practicality and intelligent design, the bathroom furniture range from VIP allows a higher level of customisation for your bathroom. Whether you’re in desperate need of storage space or simply want to upgrade a tired bathroom, our range of quality bathroom furniture is perfect for you and your needs. Furniture makes up a large part of the bathroom, which is why it can play a huge part in setting the entire tone of your bathing area. This is why we stock a wide range of bathroom furniture, encompassing many different styles, sizes and types. From space-saving and stylish vanity units to entire bathroom furniture packs, we have an unmatched selection that guarantees style and affordability, using only the finest materials in the business. Basin can be fitted in two positions, allowing the tap to be on the left or right hand side, allowing you increased customisation. The great value price, plus the high quality of manufacturing, makes this the ideal choice for your home. (please select via drop-down menu below).